It was a pleasure to attend Armagh Baptist Church on Tuesday 18th September. This service gives an opportunity for the students’ families, and friends and members from their local churches to come and show support and encouragement as they embark upon God’s calling upon their lives in studying His word. The evening began with the singing of God’s praises followed by the chairman Mr Phillip Hadden’s welcoming remarks. Mr Nigel Younge, Director of Training, introduced the new students, with Dr David Luke giving a prayer of dedication. The new students have brought both a local and international flavour to college this year, and it was good to hear from both when Dr Sarah Dalrymple interviewed Jurriën St Jago from the Netherlands and Grace Henry from the equally glamorous Larne, on why they chose IBC and their hopes for their time at college. Principal Edwin Ewart gave the college update, with emphasis upon the success of the Ministry Partnership Scheme. 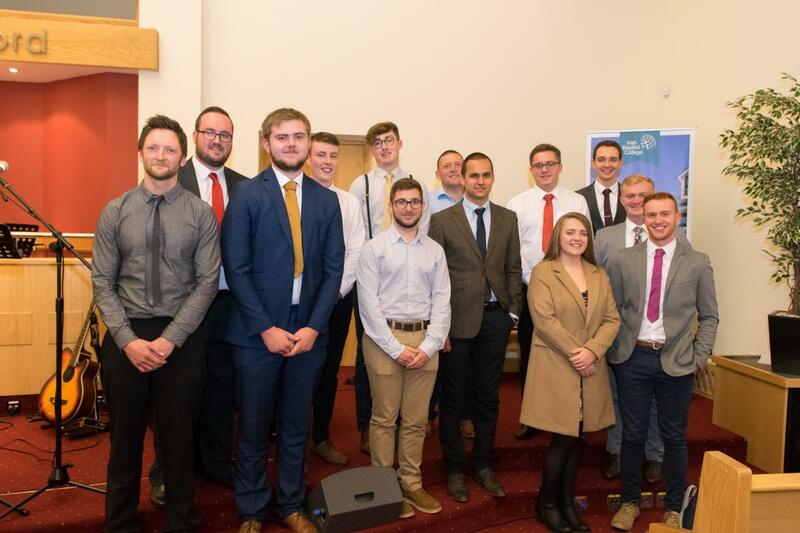 The latest graduates to benefit from the scheme are: Timothy McFarland (assistant Pastor, Carrickmacross Baptist), and Paul McAdam (assistant Pastor, Armagh Baptist). Pastor Ian Grant shared a very pertinent word for all the congregation from Titus 1. He reminded us that we have ‘a mission, a hope, a method, and a message’ in our knowing and preaching of the Gospel. The Church has a message of Salvation, through a Saviour, who brings us back into relationship with God as our Heavenly Father. Please remember to keep all the students and faculty within the College in your prayers as they study God’s word so that all will be to the Glory and Honour of God.